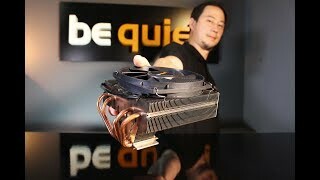 SHADOW ROCK TF 2 silent premium Air coolers from be quiet! Shadow Rock TF 2 is the perfect cooler for PC systems with restricted space. It offers the best mix of performance and price in the premium compact CPU cooler segment. Shadow Rock TF 2 is equipped with five 6mm heat pipes. They carry the heat straight to optimal locations on the cooling fins and provide the system with a remarkable compact cooling capacity of 160W TDP. 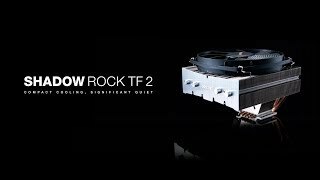 An ingenious cooling concept: The baseplate and the cooling fins of Shadow Rock TF 2 are directly connected. This ensures fast heat transfer and optimum cooling efficiency. Silent operation typical for be quiet! products is achieved by the silence-optimized 135mm be quiet! fan. Delivering the best balance between cooling performance and quietness its smooth operation is thanks to the nine airflow-optimized fan blades and durable rifle-bearing technology. The small diagonal fins on the back of the cooler direct the airflow to guarantee efficient cooling for the CPU as well as components around the Intel® or AMD™ socket. The top-flow design is perfect for anyone who has to cope with limited space restrictions when building a system. Shadow Rock TF 2 more than solves this problem.